My pet peeve: When people say national paid family and medical leave in this country is a long way off. I understand why they say it. Too many members of Congress today are more concerned about politics than people. And ideology too often trumps evidence when it comes to addressing the real issues we’re facing as a nation. The situation is disheartening, and it’s why some advocates and lawmakers are convinced that we should push for solutions that fall short of a national paid leave law. But the country has major problems that require a national solution. And there are 138 million reasons — one for every worker without paid family leave in this country — to keep fighting. There are 3.9 million children born every year who deserve better. There are approximately 6.3 million older Americans in need of long-term care. Some states have paid leave policies, but the states that have populations most in need will very likely never adopt them, and that will perpetuate short- and long-term inequalities in health and economic well-being and more. And the country continues to lose about five percent of GDP annually (equal to approximately $871 billion in 2014), in part because our lack of supportive policies suppresses women’s workforce attachment. The United States is also the only high-wealth country that doesn’t guarantee some form of paid leave to new mothers, one of a handful that doesn’t guarantee paid leave to new fathers and one of two that doesn’t provide even basic paid sick days protections. This international outlier status poses a real threat to our global competitiveness. It’s stunning, difficult to explain and, quite frankly, embarrassing. But politically we’re in a remarkable moment of opportunity. I know it wasn’t just me who cheered when presidential hopefuls included paid family and medical leave in their opening statements at one of the first debates. 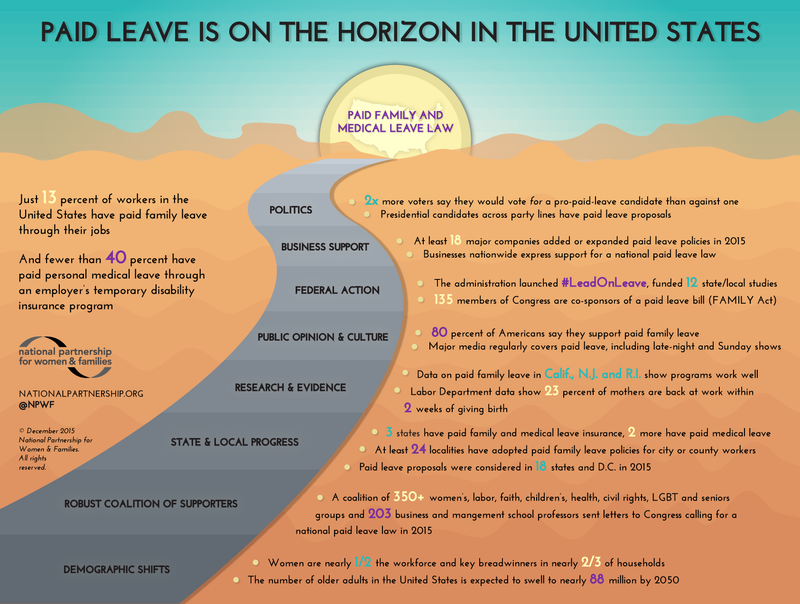 Paid family and medical leave is on the agenda in a more real and visible way than ever before, thanks to the efforts of national advocates and leaders, state coalitions and lawmakers, forward-thinking business owners and savvy journalists and entertainers. In just the last year, President Obama declared that the country needs a national paid family and medical leave law, and he has taken action by expanding access to paid leave for family caregiving to federal workers. His administration also launched a national paid leave campaign and tour to engage workers, lawmakers, and business leaders in the paid leave conversation. And the administration awarded 12 grants to states and localities to study paid leave. These efforts are unprecedented. Some federal lawmakers are showing real leadership too. More members of Congress than ever before, including many of its rising stars and longtime champions for working families, have co-sponsored the Family And Medical Insurance Leave (FAMILY) Act — the leading federal paid leave proposal. And even though the FAMILY Act’s supporters happen to all be Democrats, some Republicans are arguing that, in America, things should be different when it comes to access to paid family and medical leave. Three states — California (2002), New Jersey (2008) and Rhode Island (2013) — established paid family leave insurance programs years ago. Those states and two others — Hawaii and New York — also have temporary disability insurance laws that ensure workers access to paid medical leave. Evidence from these programs has made clear that public paid leave policies work well. Opponents’ claims have been disproved; studies, including business industry studies, show largely positive or neutral effects; and the laws have been used more than one million times. Other states are taking note. In 2015 alone, lawmakers in 18 states and the District of Columbia considered paid leave. Some of those proposals advanced with bipartisan support. Businesses are getting on board too. In 2015, at least 18 high-profile companies in tech, hospitality, manufacturing and more adopted new or expanded existing paid family leave policies, and more than three dozen CEOs and business leaders have gone further by calling for a national paid leave policy. This fall, more than 200 business school professors who not only understand good business practices but also teach the next generation of business leaders called on Congress to consider the FAMILY Act. There is also a growing body of evidence that shows paid leave is good for all — for health, the workforce, the tax base and the economy. And comedians like John Oliver, journalists, filmmakers, celebrities and working moms have taken on the issue in new and compelling ways, highlighting how badly the country gets it wrong when it comes to public policies that reflect the family values our leaders so often profess. And do you know what’s especially encouraging about all of this? The FAMILY Act was first introduced in Congress two years ago tomorrow and much of this tremendous progress has come to fruition since then. That day kicked off a major effort that may have created a true watershed moment for paid leave in this country, made possible by the decades of hard work that came before it. So, we’re at a crossroads as a country, and a national paid family and medical leave law is indeed on the horizon. We can no longer, and must not, say that a national program is a long way off if we believe that the opposite should be true. We must instead commit to doing all that we can to make sure that paid leave is the next big thing the United States does to help working families. Instead of writing off federal-level action as too big or difficult, we must use stories and evidence to hold lawmakers accountable. We must make the most of this moment. That means voters asking questions in every public forum or town hall, and political donors asking hard questions of candidates. It means constituents contacting legislators to let them know what’s at stake. It means academics fast-tracking relevant research and speaking out about the results. It means businesses evaluating the costs of the current patchwork or — for some — the cost of doing nothing, changing their own policies and calling for public policy. P.S. I haven’t thought of myself as an optimist until recently. But here’s the thing: If we can overcome barriers real and imagined, there will be major advances at the federal level in making paid family and medical leave a reality for America’s working families. National paid family and medical leave need not be a long way off. Let’s make sure the country is poised to join the rest of the developed world.